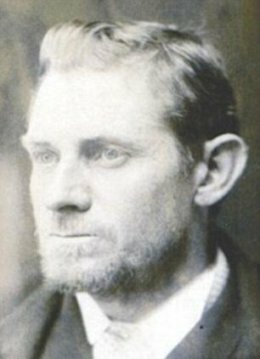 On this day in 1892, Frederick Bailey Deeming was hanged in Melbourne, Australia for the murder of his second wife, Emily Mather. She was not his only victim; he’d also murdered his first wife, son and three daughters. Deeming was born and raised in Ashby-de-la-Zouch in the UK. One of seven children, he was reportedly a “difficult” child. He later claimed he’d spent years in mental hospitals as a youth, something his brother disputed. Deeming ran away to sea at sixteen and began committing crimes, mostly thefts. Wherever he went, he swindled and stole from people. Deeming married Marie James in 1881 (his brother married Marie’s sister) and they moved to Australia. They went on to have four children. In 1888, Deeming and his family moved to South Africa. His movements around that time are unclear, but he was definitely back in England by November 1889, and separated from his wife and children, who lived in another city. Deeming bigamously married Helen Matheson in 1890, and deserted her shortly after the honeymoon. He visited his wife, gave her some money and told he was going to South America and would send for her and the children once he’d settled. Before he left he conned some jewelers in Hull; as a result, he was arrested upon his arrival in Montevideo, Uruguay and sent back to England to serve nine months in the clink. In 1891, after his release from prison, Deeming took the name “Albert Williams” and leased a house in the village of Rainhill. A woman and several children were seen visiting him; he claimed they were his sister and her children. The woman and children disappeared — off to an extended holiday, Deeming said. A short time later, complaining that the drains were defective, Deeming had the floor of his house re-concreted. In fact, the “sister” was his first wife Marie and the “nieces” and “nephews” his own children — Bertha, 9, Marie, 7, Sidney, 5, and Leala, 18 months. And in fact, they were “vacationing” permanently, under the concrete floor. 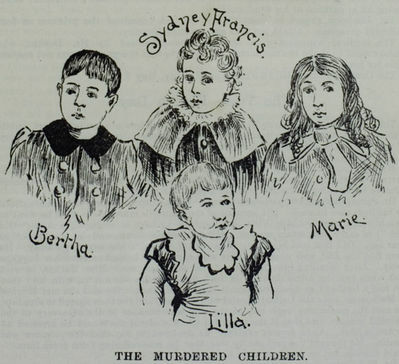 Authorities believe he killed them on or about July 26, 1891. By that time, Deeming was already courting Emily Lydia Mather. They married on September 22 and by December 1891 had up and moved to Melbourne. Emily didn’t make it past Christmas before Deeming had her entombed under the fireplace. In January 1892, Deeming moved to Sydney. On the way he met a delightful young lady named Kate Rousenfell. He gave her several expensive gifts, including jewelry he’d stolen while he was in Melbourne, and proposed marriage. She agreed and said she would join him in Western Australia when he moved there. But the course of true love never did run smooth, and Miss Rousenfell was cheated of her bridegroom by Deeming’s March 11 arrest for Emily’s murder. Emily’s body had been discovered on March 3, after the house’s owner, investigating his new tenant’s complaints of a strange smell, raised the hearthstone. Her throat had been cut and her skull was fractured. When Deeming was taken into custody, he had some of her things with him, including her prayer book. The murder case received extensive publicity and when those back in England heard of it, they decided to have a look at Deeming’s former home in Rainhill. There they dug up the bodies of Marie and the four children. At his trial, Deeming claimed insanity and brain damage from epilepsy and tertiary syphilis, and said his dead mother’s spirit had ordered him to commit the murders. He told the jury that Marie wasn’t dead and had, in fact, left him for another man. In the three weeks between the verdict and the hanging he penned his biography and some bad poetry. English publishers offered him £1,000 for the rights to his writings, but the Australian government had them all destroyed. There have been suggestions, in Deeming’s time and ours, that he was the serial killer Jack the Ripper, who slaughtered and mutilated a handful of London prostitutes in 1888. The fact that evidence indicates Deeming was in South Africa at the time of the Jack the Ripper murders hasn’t stopped the speculation. He allegedly told his cellmates he was the Ripper, but when asked directly by the authorities, he refused to answer yes or no. 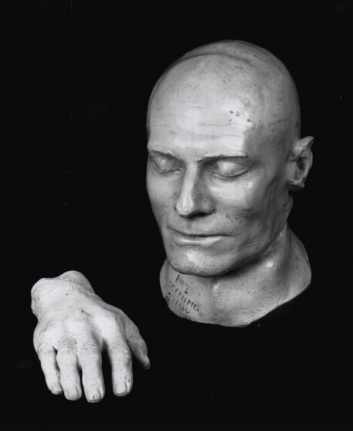 Deeming’s skull and death mask are still on display in the Old Melbourne Gaol Museum.